My biggest question is, how much of a drop as far as spindles go after dropping down the 2.5 from the extension? I know tire size will play a roll in this too. Also factor in an adjustable beam. Where the adjusters were clocked when welded in, even with the 2.5" drop on the extender, and 2" drop spindles, We still dropped it a good bit more with the adjustable beam to get a ride height we all liked. stock height beam jsut wasn't low enough for wehat we were looking at with 4.5". IIRC with a couple of our fat asses sitting on the front with the adjusters totally bottomed out, we were about an inch off the deck at the actual frame head. Last edited by HeidelbergJohn4.0; March 25th, 2012 at 03:00 PM. That's what I was lookin for. Thanks. Just got my 10 inch extension in the mail. Need to get the baja outta storage in a few weeks and start the project. Can't wait. Drop spindles and disc brakes to come. Anyone have a line on a brake conversion kit for wide fives? Last edited by SlimJim; July 28th, 2013 at 08:14 AM. As far as I know there are only kits for 4 luggers. So youll have to run 4 lugs in the front. 4 lug to 5 lug adapters hit the Caliper so those dont work either. ok guys here is my stupid question will the stock gas tank fit back in with 8in extender and brace? or will i have to buy another tank? Last edited by punkabilly; May 15th, 2014 at 08:16 AM. I have a '72 standard with a DBug brace.. I have 1 inch square tubing under the lip of my tank to raise it, but I THINK that was done because of how my steering column and u-joints fit..
edit: in order to accommodate having the bar stock under the lip of the tank to raise the tank 1 inch, you also have to buy longer bolts.. I'll try and remember to take a pic of two when I get home from work today..
Last edited by tattooed_pariah; May 15th, 2014 at 10:44 AM. It rests on what's left of the metal frame pieces in front of the tank and the tank sits on top of it..
Last edited by tattooed_pariah; May 15th, 2014 at 04:12 PM. I have a question about the price of the beams and braces.. 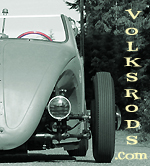 Since Volksrod shop website no longer shows the prices! What happened to the site? Bottom of his contact page says he's temporarily not taking orders. I'm meeting a guy in an hour to hopefully finally get my 2 year delayed project off the ground, looks like it won't be a volksrod for a while. The Products Page and Shopping Cart have been temporarily taken down due to the amazing amount of customer orders. Thank you. Thank you. Shoot him an email and I'm sure he'll get back with you when he's ready to start up again. G'day, Can anyone tell me where Dbug41 is located. Cheers. Dero. Hi DERO. You can reach Doug at doug.thevrshop@gmail.com he is ( I think) just moving into a new home and it may take him a couple of days to get back to you. If you don't hear from him pretty soon private message me and I'll get the two of you together. Silly question. What do you do about the steering stabilizer if you go center steer?